Williamsburg, NY - The NYPD is turning to the public for assistance, hoping that video surveillance footage will help them solve a burglary that took place in a Williamsburg synagogue just over one month ago. Police said that the incident took place at approximately 2 AM on June 21st at the Satmar Shul At Hooper Street and Kent Avenue, with an unidentified individual removing $400 from the charity box before leaving the scene. 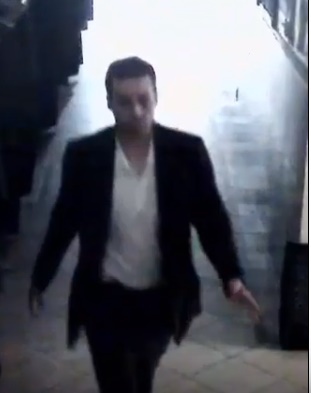 The suspect, a white man dressed in a black jacket, white shirt, black pants, a black yarmulke, and white shoes, was captured on video by the synagogue’s surveillance system. Looks like he was taking an umbrella not a pushka. looks like a modern orthodox guy with sneakers on so he can run fast. Once in a shul I davened at in the US, some one stole money from the pushka. The rav told us, let him have it, he probably needs it. that is how it ended.